Operating Seasons and Hours: The Ranch is generally open for visitors on Thursdays and Fridays from 9:00 am to 2:00 pm and on Saturdays from 10:00 am to 5:00 pm. Hours can vary depending on the season. 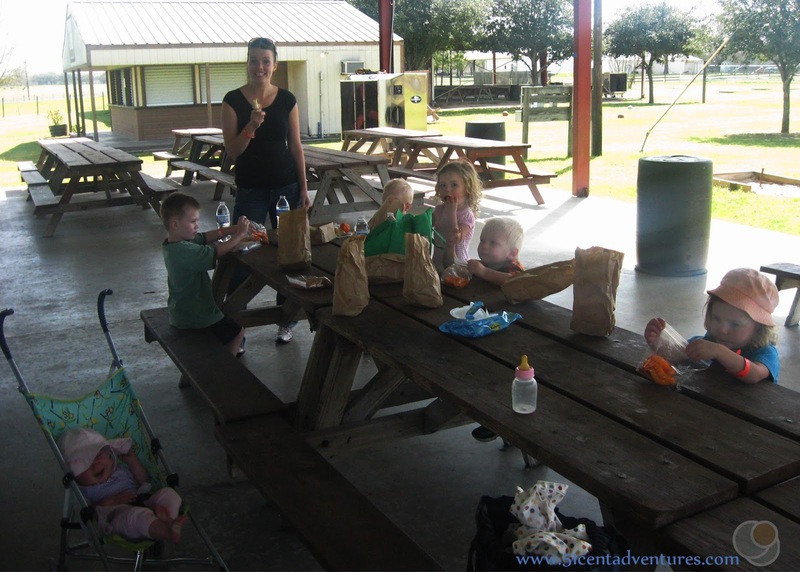 You can also schedule corporate events, field trips, and family reunions throughout the week. My husband was deployed to Korea for most of 2014. I stayed behind in Fort Hood, Texas with our four young children. My family had many friends and neighbors who helped us out during that time. One person who deserves a lot of praise was my sister who lived in Houston which was "only" three hours away. Three hours may sound like a lot, but it was actually the closest we'd lived to each other in years. When I'd first moved to Texas we'd made a pledge to see each other once a month. Her family would often come to my house, and my family was always welcome visit her. Looking forward to our time together was something that really helped me get through the long days without my husband around. In March of 2014 we got together in Houston for a few days for Spring Break. I'm not sure why exactly we called it Spring Break since none of our 6 children were in school yet. I guess everyone else was on Spring Break that week so we just went along with it too. 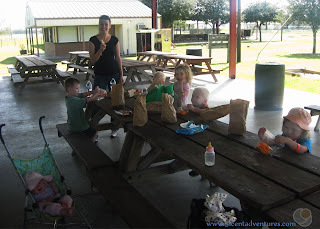 We spent one day at Stewart Beach in Galveston. The next day we went somewhere closer to my sister's home on the northwest side of Houston. My sister made a reservation for us to go to Oil Ranch in Hockley, Texas. She'd invited some of her friends along so that we could have enough people the group rate. 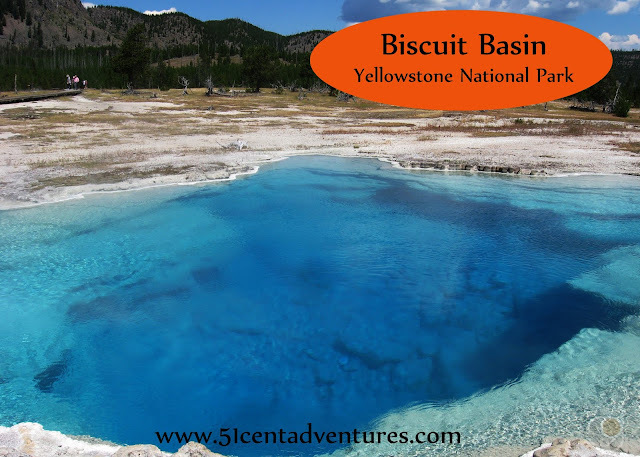 At the time the regular admission price was $15 and with the group rate we only had to pay $8 a person. Even with the discount I was a little nervous that my kids would hate the farm and it would be a waste of money. Instead everyone loved it. I was very impressed by the ranch and I felt it was worth the money. There were many activities included in the price of admission. If we'd had to pay for these things on their own the total would easily have passed what we paid. 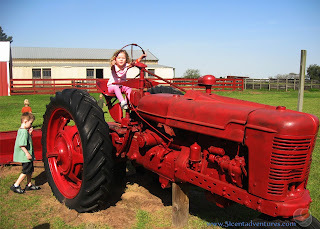 In addition to being full of entertaining activities, the ranch was also a great way to introduce my kids to farm life. 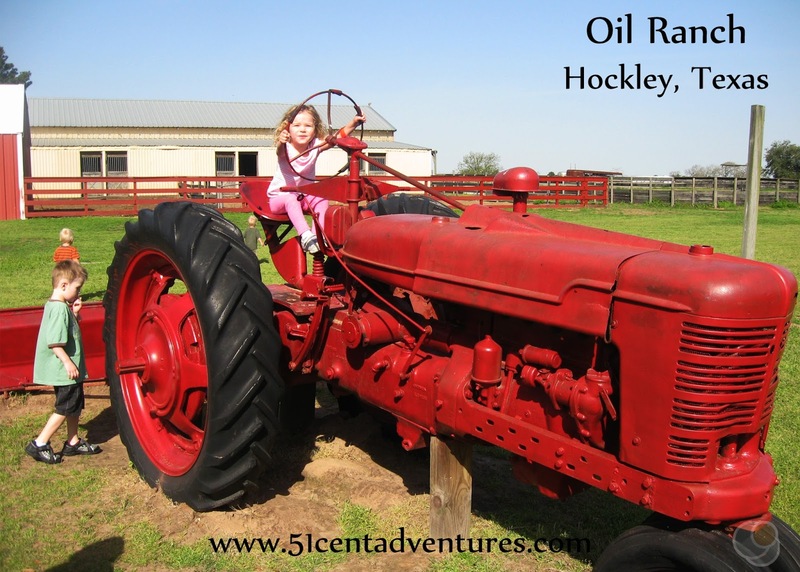 After our visit to Oil Ranch my three year old twins started talking about how they wanted to grow up to be farmers. Even now, over three years later, they still want to live on a farm when they grow up. The ranch had a cow that you could milk. I tried it and it was really cool. My daughter was too scared to try to milk it, but she did feed it. 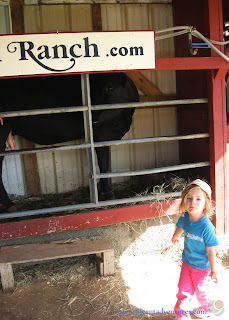 After the cow we went and stood in line for pony rides. As I said, I really liked that everything was already included in the admission. I didn't have to pay extra for the kids to ride on the ponies. This could easily have cost us between $5 to $10 somewhere else. I was distracted by my baby when I heard one of my three year olds yell, "Mom look at me! I'm riding a horse!" 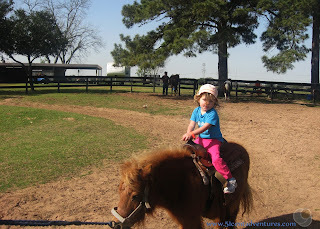 She hadn't been afraid to get put on the pony at all. The other twin was excited for her pony ride too. There was a big barn with lots of animals inside. There were bunnies, pigs, horses, and chickens. They even had chicks for sale for $4.50. 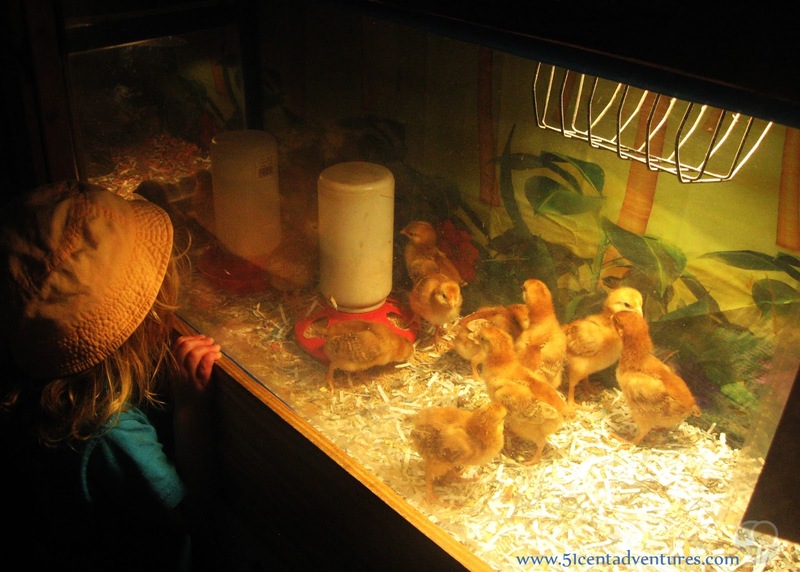 The twins kept trying to convince me to buy them a chick. 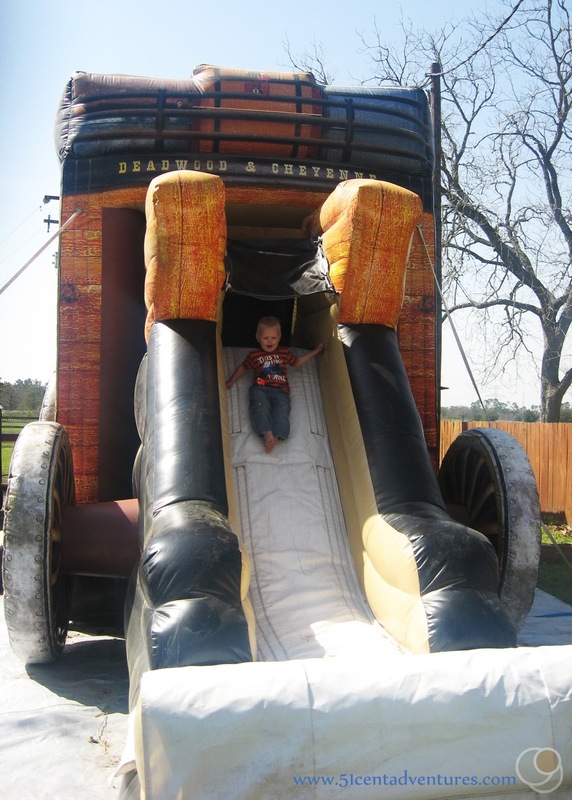 There was a big blow up slide that my children loved sliding down. They spent quite a bit of time playing on this. There was an area where you could pan for gold. This was not included in the price of admission. My nephew bought a bag of dirt with some birthday money and sifted a bunch of gems out of the dirt. My kids were content to play in the water. 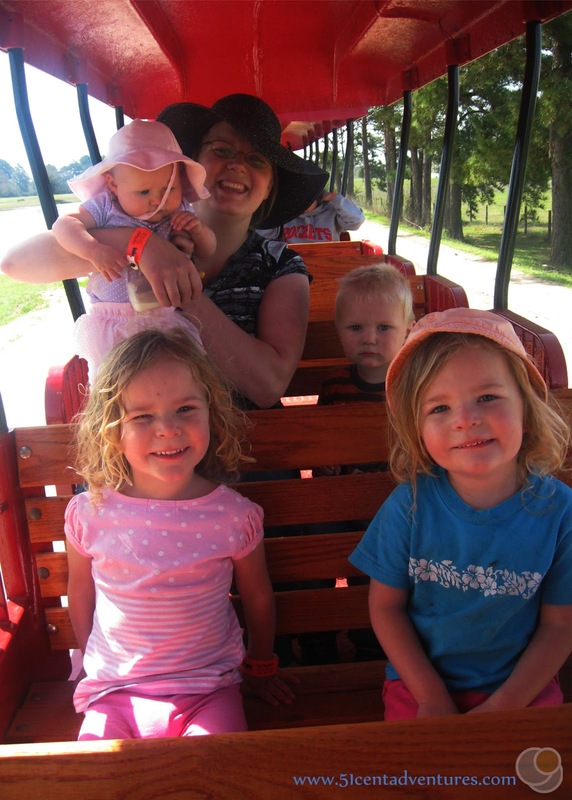 We all really liked riding on the train. Again, I was so happy that this was included in the cost of admission. I've paid anywhere from $2 to $5 for rides on similar trains. 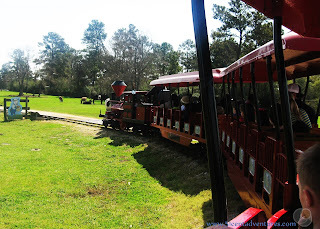 My favorite thing about the train was that we could ride it as much as we wanted. We only went on it once, but that's because we were there before my son became obsessed with trains. If we went there today he would insist on riding the train over and over again. 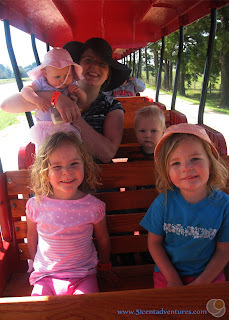 The train took us all around one side of the ranch. 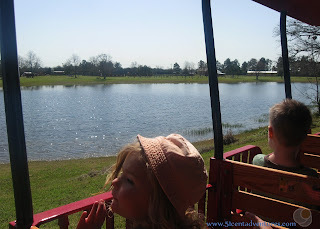 We were able to see cows, sheep, geese, lamas, and other animals without needing to walk around. I appreciated that there was lots of different scenery to look at while we rode. This was probably one the most interesting small train rides I've ever been on. Usually you're just riding around a small park. 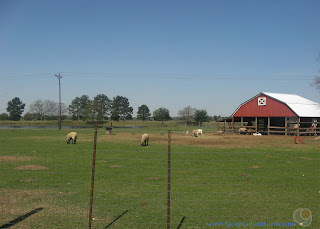 Here are some of the sheep that we saw as we rode. This was only March so the weather wasn't blistering hot yet, but still it was nice that we didn't have to walk around in the heat. After the train ride we stopped for lunch. My sister showed her awesome creativity. She had made us all sack lunches. She'd labeled each sack with a fun name for each child. It was so easy to serve everyone by just handing them their labeled lunch. I have borrowed this idea many times. Our children were getting tired so we left pretty soon after lunch. I'm pretty certain we saw most of the Ranch, but the website says that they have a miniature golf course. I don't know if we just skipped that or if it was added in the past 3 years. I know that my kids would LOVE to play miniature golf if we went there again. The website also says the ranch has a pool that is open during the summer. This would be a great way to stay cool in the summer. 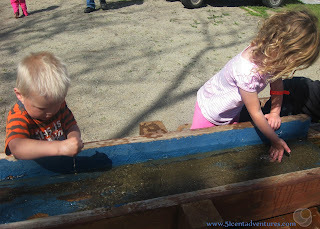 Our visit to Oil Ranch was very fun and worth the money. 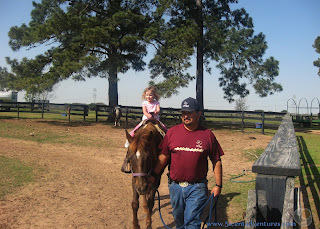 My girls still talk about riding the pony's, and seeing the animals. Recommendation: At first glance Oil Ranch seems to be very expensive. But if you add up the cost of all the individual things you can do with your admission price, then Oil Ranch is actually very affordable. It's a great place to spend the day. Directions: Oil Ranch is approximately 50 miles northwest of downtown Houston. Take Highway 290 to the Exit for Hegar Road. Drive north on Hegar Road for 7 miles then turn right onto Macedonia Road. Oil Ranch will be on the left. Places Nearby: Dewberry Farm is another farm open to the public on the western side of Houston. This one is west of Katy and is only open in the Fall. Prices for the fun pass are similar to Oil Ranch.